Sometimes it’s the little things that matter most, even when you’re talking about the biggest smartphone on the market. Aside from the super-sized 6.5-inch display, the iPhone XS Max and its smaller sibling, the iPhone XS don’t include any big changes from the iPhone X, which was introduced last year and is now being retired. But as Consumer Reports testing has revealed, what Apple did add makes a big difference. The most noticeable improvement is in battery life. Previous iPhones have typically lagged the competition in this area, but the new models have a lot more staying power, now rating among the industry's leaders. Apple also managed to make its already top-rated cameras just a bit better, and boost the phones’ overall performance with a new, faster processor. For all of those reasons, the iPhone XS and XS Max (which start at $1,000 and $1,100, respectively, for 64GB models) were able to grab lofty spots in our ratings amid a very crowded field of high-performing phones. They didn’t outscore the No. 1-rated Samsung Galaxy Note9, but they managed to come close. Here’s a closer look at how the iPhone XS and XS Max did in our testing. Consumer Reports members looking for more detailed results can check out our full smartphone ratings. Battery life has traditionally been the iPhone’s Achilles' heel. Even Apple’s larger phones, which arguably had more space for a bigger battery, have not done as well in our testing as the premier phones from some other companies. With these latest offerings, Apple argued that the faster, more efficient A12 Bionic processor would help boost the amount of time between charges. The company claims the XS can last about 30 minutes longer than last year’s iPhone X. And it says the XS Max, which has a bigger battery than those two, can last up to 90 minutes longer. Our lab testing shows that Apple more than made good on those claims. To find out how long a phone’s battery can go, Consumer Reports uses a robotic finger programmed to put the phone through a range of tasks designed to simulate a consumer’s average day. The robot browses the internet, takes pictures, uses GPS navigation, and, of course, makes phone calls. For the sake of consistency, we run all smartphone battery tests with the display set to 100 percent brightness. But if you want to extend battery life on your phone, it's useful to turn on the auto or adaptive brightness function, which independently adjusts the display to suit the lighting environment. In our testing, the iPhone XS lasted 24.5 hours, and the Max made it to 26 hours. That’s a big step up from the iPhone X’s 19.5-hour performance and puts the new iPhones up there with this year’s marathon-running Samsung phones in our ratings. However, it's worth noting that both iPhones charge demonstrably slower than other phones on the market. In our testing, which used the chargers that came with the phones, the battery in the XS took 195 minutes to go from zero to 100 percent and the one in the XS Max took 210. In comparison, Samsung's Note9 takes 105 minutes. Even before the rollout of its newest phones, Apple laid claim to the best smartphone camera on the market. When it launched last year, the iPhone X featured the highest-rated camera we had ever tested. But the iPhone XS and XS Max managed to improve on that performance, if only just a little. The phones received slightly better scores when it came to the quality of the still and video images taken by their rear cameras. In particular, our testers admired the clarity and resolution of the still photos, which give the iPhone cameras a slight edge over those of Apple's chief rival, Samsung, says Richard Fisco, who heads CR’s smartphone testing program. These days, only fractions of a point separate the top 10 smartphone cameras in our ratings. 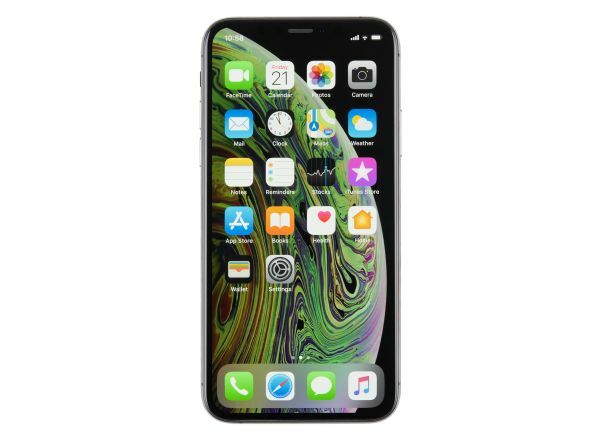 In fact, the image-quality improvements in the new iPhones may be tough for the average person to see, according to Fisco. However, he says, the upgrades to the Portrait mode are more evident. The popular photography technique—also known as bokeh—lets you take portraits where the subject remains in sharp focus in the foreground and the background is blurred in an artsy way. In previous iPhones, Portrait mode would automatically blur the background to a predetermined extent to create this effect. But the cameras on the XS and XS Max let you manually adjust the amount of blur after you take the picture. The iPhones' bokeh photos aren’t going to match the quality of the ones taken with a high-end stand-alone camera, but it’s fun to be able to play with the amount of blur in a photo. Apple says the idea behind its custom-built A12 Bionic processor was to make the phone run faster without sucking the battery dry. The chip includes two "performance" cores designed to handle the heaviest of processing demands, along with four "efficiency" cores to take care of mundane tasks. All six kick in when extra power is needed. The phones also have a specially designed four-core graphics processing unit developed with an eye toward gaming. The day the new iPhones launched, we ran two standard benchmark tests on the XS (the Max has the same chip), stressing the phone’s main and graphics processors by making them carry out a series of operations. For comparative purposes, we also ran the tests on the iPhone X, iPhone 8, and the Note9. The XS beat them all. But the other contenders didn't perform significantly worse, especially considering the relatively non-demanding tasks consumers typically perform on their phones. So most people aren’t going to notice that extra horsepower operating behind the scenes. But in practical terms, the new chip should help apps open faster and graphics-heavy or augmented-reality games run smoother, Fisco says. Given the results of our admittedly brutal tumble test, you should probably consider investing in a sturdy protective case if you purchase an iPhone XS or XS Max. The tumbler is a rotating chamber that repeatedly drops a phone from a height of about 2.5 feet. The phone is checked for damage after 50 drops and then again after 100. The goal of all that repetition is to expose it to impacts from a wide variety of angles. Apple says the glass used in its newest models is the toughest on the market. Nevertheless, in the case of the iPhone XS, two of the three sample phones we took for a spin were noticeably damaged after 50 drops. The front glass of the first phone was broken but the display worked. The second phone’s rear camera was damaged. After 100 drops, it didn’t work at all. But the display survived intact. The iPhone XS Max was a little more successful. One model made it through all 100 drops without breaking. Another made it through 50 but emerged after 100 with the back glass broken. The display on the third phone was damaged after 50 drops. In comparison, tumbled samples of the Note9 made it through all 100 drops with the glass intact and just a few minor dings. In addition to the durability issue, the iPhones lost points in our testing because they don’t allow you to use an SD card to add storage. But overall, for what are largely incremental updates to last year’s iPhone X, Apple made all of its tweaks in the right places. While they may not be enough to convince iPhone X owners to upgrade, iOS fans with older models—and at least $1,000 to spend—might want to think about it.